Designated trim lines are provided to accommodate models equipped with cargo area floor vents. WeatherTech Cargo Liners provide complete trunk and cargo area protection. 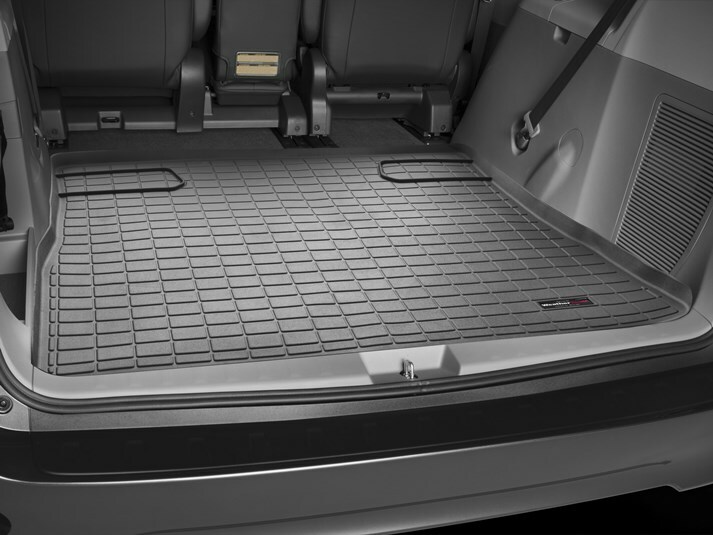 Our Cargo Liners are digitally designed to fit your 2015 Toyota Sienna and feature a raised lip to keep spills, dirt and grease off your vehicle’s interior, protecting your investment from normal wear and tear. Have you ever seen a muddy Newfoundland? Well just in case you haven't, we are talking about the messiest yuchy pup you've ever laid eyes on - And the smell is even worse! So imagine how thrilled we were to receive our cargo liner the day we had plans to visit the local dog park - Two days after the blizzard thaw! Covered head-to-toe in mud, me, hubbie, 4 year old Gianna and Oscar the Newfoundland treked back to the van - What could we do except just let him jump in the back and hope for the best - Well - That new WeatherTech cargo liner really saved the day- And our car!! Easy to clean and not slippery (Oscar wasn't slip-sliding around) Next - We're ready for the beach! After a season of skiing, my stock floor mats were ruined. And my family mini-van smelled like a wet dog from the water that stayed in my carpets through the spring. I asked the auto detailer if I should buy a new set of mats and he suggested waterproof cargo liners. What a solution. I didn't know that such a custom application would be available for a Sienna. I've got the liners down in all three rows and I feel like I am snow, mud and kid-proof.